The process of adopting positivity lies in ignoring the harsh facts regarding what people think about you. You must move on to discover and welcome changes. This is something really unique to emerge out a different personality. To be truthful, do take this noble endeavor to grab positivity out of every situation. Don't allow the opinions of others to restrict you from doing the things you love. If you don't know , then ask me. if don't agree, then argue with me. If you don't like me, then say it to me. 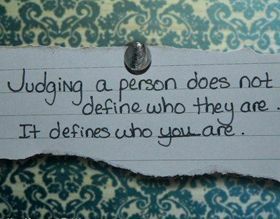 But don't starting judging me silently. You'll never live a happy life if you always care about what others think about you. This is your life, not theirs, don't worry about what people think, do what you like. People gonna hate you, judge you, break you, but how strong you stand, thats what makes defines you and make you stand strong in the time of adversity. Care not what they think of your lifestyle, your body, your clothes, your age, your humor, your beliefs, your preferences or your opinion. You alone decide what you're worth.